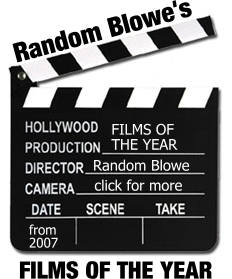 Random Blowe: Who's Afraid Of Brendan Barber? Who's Afraid Of Brendan Barber? I'm guessing Cameron and the Bullingdon boys will have viewed with some scepticism Brendan Barber's speech at TUC Congress today that pledged that "where members, faced with attacks on jobs, pay or pensions take a democratic decision for industrial action, they will have the support of unions and the TUC stands ready to co-ordinate that." Barber is, after all, the archetypal trade union bureaucrat who has worked as an official since leaving university and has been at the TUC for 35 years. The motion at today's session of the TUC Congress, calling for its general council to "support and co-ordinate campaigning and joint union industrial action, nationally and locally, in opposition to attacks on jobs, pensions, pay or public services" is undoubtedly impressive, but something about that promise to 'coordinate' triggered a distant memory. Back in 2007, the Congress passed a similar motion for "co-ordinated industrial action" against the then Labour government over a below-inflation pay settlement for public sector workers. 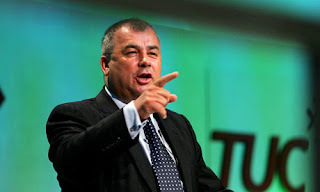 Brendan Barber pledged that TUC would, according to a BBC report I found, "bring unions together and co-ordinate action, including industrial action" and warned of the "heavy price" the government would pay if it failed to change its mind. I'm a TGWU member and Barber's speech looks very much like what we know as the 'Bill Morris Two Step' - sounding radical but ultimately managing to do as little as possible that is actually radical. Barber's comments in the Independent today, in which he said he looked "back to the poll-tax campaign for inspiration" appear like a classic example of nimble political footwork. But it's worth remembering too that there's a reason why serial compromisers like Barber are now starting to promise to take action against the ConDem cuts. The trade union movement is still one of the great democratic institutions this country has and union leaders are being pushed by the groundswell of anger and alarm from below. One of the big differences from the past, however, is that most union members do not feel any particular loyalty to the leadership within the TUC general council - if anything, combative general secretaries like Mark Serwotka and Bob Crow are the only ones likely to be have great respect from the membership of their particular unions. So who's afraid of Brendan Barber? Maybe not the government, but they should definitely be afraid of ordinary trade unionists. The prospect that scorched-earth policies towards public services triggers a wave of industrial anger is real and Cameron and Clegg may find the likes of Barber reluctantly dragged along by union members, not leading from the front. Unlike under a Labour administration, they'll find it impossible to call on Barber to make sure that nothing happens. Nevertheless, whoever emerges as Labour's new leader could, of course, still save their skins through an attack of timidity. That's why we need to organise the resistance to government cuts ourselves - and steadfastly refuse to allow Labour and pliable union bureaucrats to take it over and neuter it.